Station Hollywood: Actress Shyama remained immortal in her works. Shyama, the veteran actor remained immortal in her works. Veteran Bollywood actor Shyama passed away on the morning of November 14, 2017 at the age of 82. Her daughter Shirrin told indianexpress.com that her mother was suffering from a lung infection, and her health deteriorated further because of that. The cremation took place at 2.30 pm at Marine Lines in Mumbai today. The actress was known for her roles in movies like Aar Paar, Barsaat Ki Raat, Sawan Bhadi, Milan and Sharada. In a more than four-decades-long career, Shyama acted in about 175 movies. She won the Filmfare Award Best Supporting Actress award for her performance in Sharada. It is very sad. The film fraternity and viewers were shocked to hear her death. She was one of the very beautiful actresses of the 1950s and 1960s. Her dance performances, powerful acting and great expression still haunt the viewers. She rose to stardom with Guru Dutt’s film Aar Par. Her lips in Geeta Dutt’s song “ae loji hari piya hui teri jeet re”, “ sun sun sun sun zalima” became super hit. OP Nayyar composed the music of the film. Aar Par was a super hit film of 1954. She did well opposite Dilip Kumar in the film Amar. 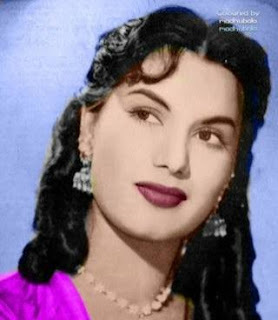 Madhubala was the other lead actress of the film. She did well in Raj Kapoor’s film Sharda. Meena Kumari played the lead role in the film. It was a super hit film of 1957. Shyama did not fear even negative characters. In Sharda in the later part of the film her role was negative. Shyama (born Khurshid Akhtar; 7 June 1935 – 14 November 2017) was a Hindi movie actress. Her best known roles were in Aar Paar (1954), Barsaat Ki Raat (1960) and Tarana. She was also noticed for her versatility through her performances in Milan, Bhai-Bhai (1956), Mirza Sahiban (1957), Bhabhi (1957) and Sharda, for which she was awarded the Filmfare Award for Best Supporting Actress. She was the actress in late 50s who has been most responsive to the rhythm and lyrics of the music directors and poets. Songs picturised on her such as "Ae dil mujhe bata de", "O chand jahan wo jaye", "Ae lo main hari piya", "Dekho, wo chand chhup ke karata hai kya ishare", "Chhupa ke meri aankhon ko", Sun Sun Zalima and "Ja re ka re badara" are examples of her sensitive acting. She did a double role in Do Bahen(1959) portraying twins who were completely different in characters. Shyama arrived in Mumbai from Lahore in the 1940s. As a young girl, she acted in a few films like Noorjahan's husband Shauqat Rizvi's Zeenat (1945) and Meerabai (1947). Director Vijay Bhatt gave her the stage name Shyama, by which she is credited in her movies. She had starring roles in Guru Dutt's classic Aar Paar, and later in Barsaat Ki Raat, which was perhaps her best performance. She was a major star in the 1950s and 1960s and acted in more than 150 movies many in starring roles. Johnny Walker and Shyama had worked in films like Choo Mantar, Aar Paar, Musafir Khanna, Khota Paisa and Khel Khilari Ka. She was married to cinematographer Fali Mistry in 1953, and the couple had two sons, Faroukh and Rohinton and a daughter Shirrin. Fali Mistry passed away in 1979, thereafter she continued to stay in Mumbai. Her close friend were actress Ameeta and Johnny Walker. Nasir Khan, Johnny Walker’s son expressed his grief on hearing the news. In an interview with Mid-Day, he said, “It’s really disheartening to know about the demise of Shyama aunty. She had done several films with my father and in a lot of them she was opposite him also. In fact, in the film that was made on his name ‘Johnny Walker’, she was the heroine with him.